Explanation: An alluring sight in southern skies, the Large Magellanic Cloud (LMC) is seen here through narrowband filters. The filters are designed to transmit only light emitted by ionized sulfur, hydrogen, and oxygen atoms. Ionized by energetic starlight, the atoms emit their characteristic light as electrons are recaptured and the atom transitions to a lower energy state. 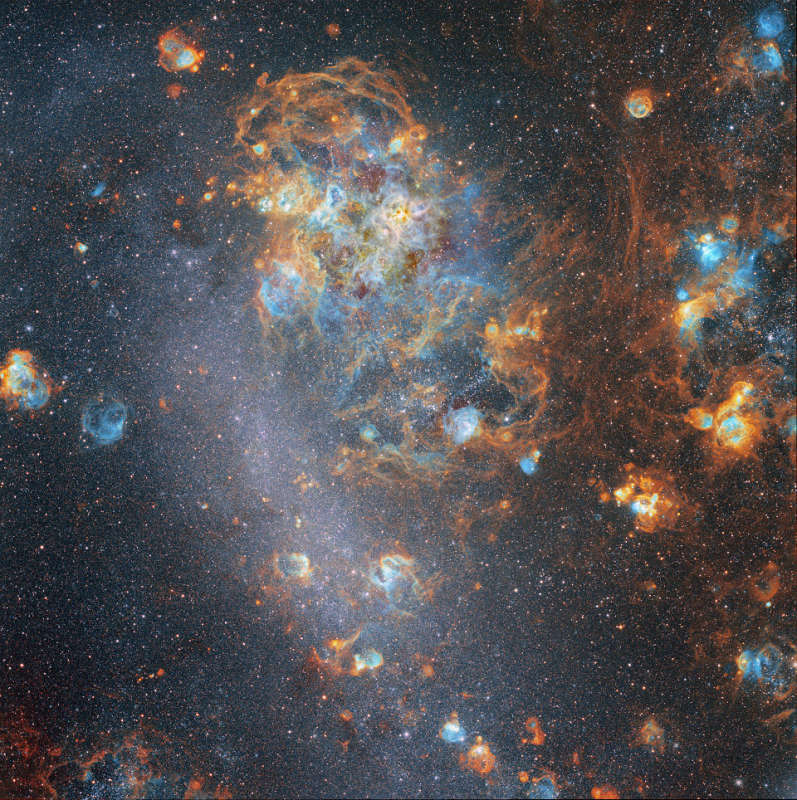 As a result, this false color image of the LMC seems covered with shell-shaped clouds of ionized gas surrounding massive, young stars. Sculpted by the strong stellar winds and ultraviolet radiation, the glowing clouds, dominated by emission from hydrogen, are known as H II (ionized hydrogen) regions. Itself composed of many overlapping shells, the Tarantula Nebula is the large star forming region at top center. A satellite of our Milky Way Galaxy, the LMC is about 15,000 light-years across and lies a mere 180,000 light-years away in the constellation Dorado.